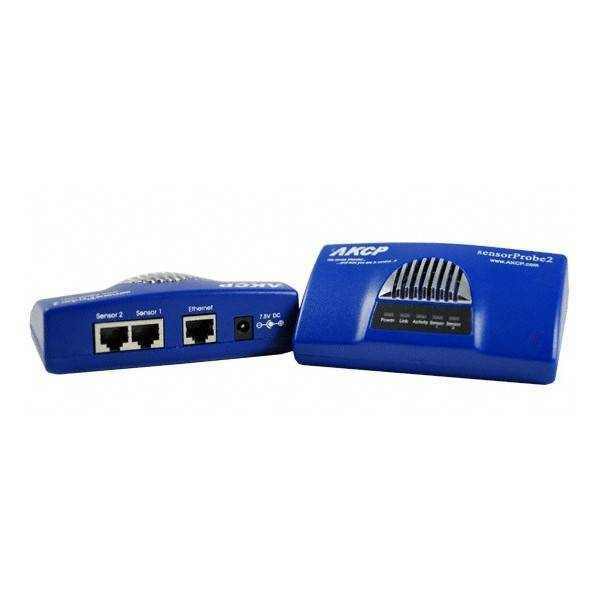 Product information "sensorProbe Bundle - Climate Monitoring"
The AKCP sensorProbe2 is a intelligent 2 port sensor device for monitoring environmental variations, power, physical threats and security.The SP2 is a completely embedded host with a proprietary Linux like Operating System, including TCP/IP stack, Web server, email and full SNMP functionality. SMS notifications can be sent via a 3rd party email-to-SMS gateway. 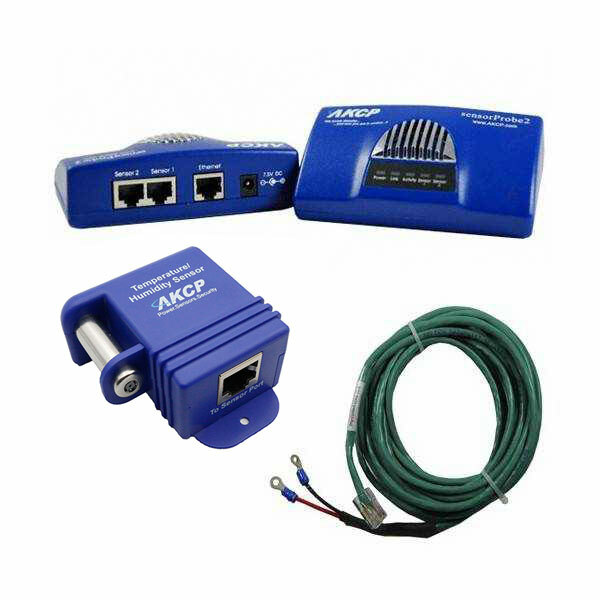 The new AKCP sensorProbe2 comes with a new CPU that is 3 times higher speed compared to the earlier version of AKCP sensorProbe2A, faster network connection, new web interface similar to sensorProbe8 series of products including the subnet mask, remote syslog interface. It also includes a battery backed time of day clock. The new AKCP sensorProbe2 also has advance events filtering options. Now you can plug in our motion detector to the new AKCP sensorProbe2. The important feature in new AKCP sensorProbe2 is, the integration with a single chip relative humidity and temperature multi sensor module comprising a calibrated digital output. The sensor includes a capacitive polymer sensing element for relative humidity and a bandgap temperature sensor. Both are seamlessly coupled to a 14bit analog to digital converter and a serial interface circuit on the same chip. This results in superior signal quality, a fast response time and insensitivity to external disturbances (EMC). 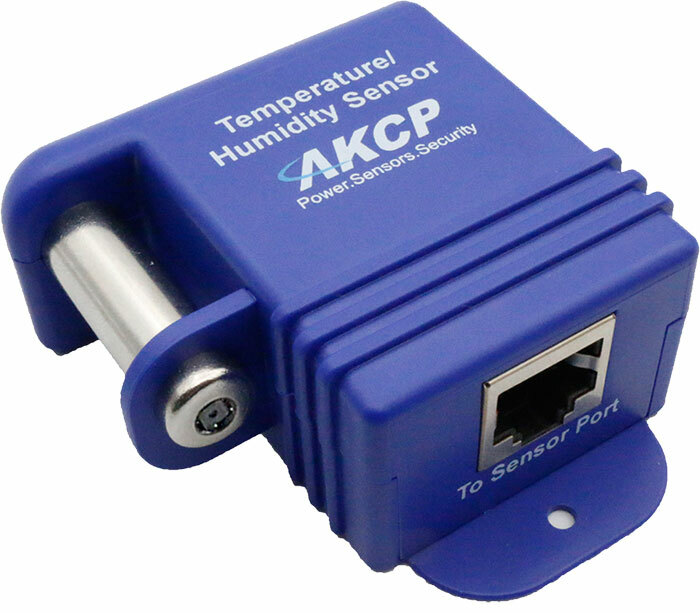 By having both temperature & humidity sensors in a single sensor, the AKCP sensorProbe2 can have up to a maximum of 2 temperature & 2 humidity sensors. This extends the capability of the AKCP sensorProbe2 to maximum of 4 sensing parameters. The dual sensor has both temperature and humidity measuring capabilities in a single sensor. This extends the capability of the sensorProbe to measure up to 8 temperature and 8 humidity sensing parameters, just by connecting 8 dual sensors. Up to 2 dual sensors can be plugged into RJ-45 jacks on the sensorProbe2 and 8 sensors on the sensorProbe8. Each sensor comes with a free CAT 5 cable 5 feet in length. 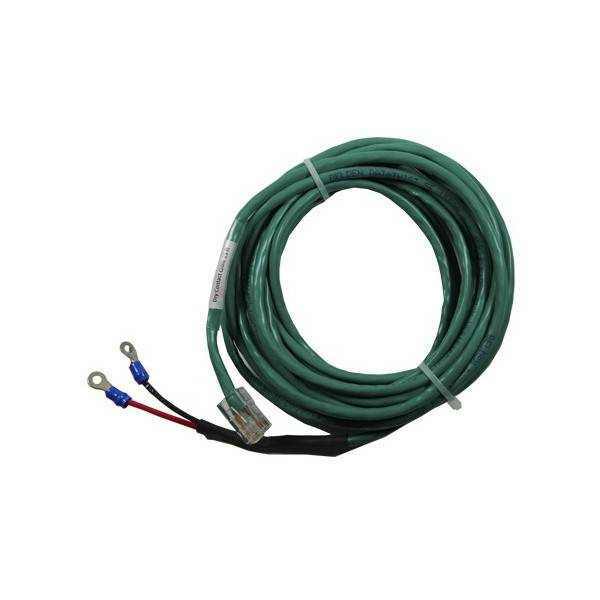 You can connect the sensor using your own CAT 5 cable up to 1000 feet, allowing the sensors to be positioned in hot spots. When the dual sensor is plugged into the RJ-45 port, the sensorProbe will auto detect the sensor, and it will display Temperature & Humidity for each RJ-45 port. A built in graph option is included on all sensorProbes for graphing temperature and humidity variations over a period of time. Each sensor has its own SNMP OID so that data can be collected over the network and graphed using external application like MRTG. Communications cable: UTP Cat 5 cable. Up to 2 dual sensors per sensorProbe2, 8 per sensorProbe8 and cameraProbe8. When used as an input a switch will retain any error condition until it is read via SNMP. Therefore if a switch encounters a critical condition at any time it must report that condition before it can return to a normal state. Input pins can be used to detect whether or not an input switch is open or closed. In combination with external sensors, input pins can detect whether a door or window is open or closed, if there is a water incursion and many other conditions. Related links to "sensorProbe Bundle - Climate Monitoring"
Size 4.5" x 2.5" x 1.25"
Important Note: The fixed one foot type or TMP01 and THS01 are not designed to be extended. If you need to extend these sensors then you need to use the TMP00 or THS00 (remote type). Customer evaluation for "sensorProbe Bundle - Climate Monitoring"